For those of you that check in often – I’m terribly sorry to have gone missing for so long. As you know from my last post, we went to Aruba and it was FANTASTIC!!!! I highly recommend planning a nice “get-away” trip for any parents that have never done so – and not just a weekend! We went with three other couples that also have a child and I think everyone will agree – IT’S WORTH IT! Then we came back and had a busy week catching up before family arrived. Then I got this weird 48 hour flu bug that had me in bed all day Saturday with fever and chills. THEN, we went out on Monday night for an early birthday celebration (mine) before my husband left town for several days. Now my husband is gone, family is still here and I’m finally taking a moment to post something sentimental and funny. Friends have always been a HUGE part of my life. It was just my mother and I while I was growing up, so my friends were often just like siblings to me (but we didn’t fight as much). I spent family vacations with my friends and their families and endless “overnights”. There have been friends that have come and gone and many friends who are still, to me, like the siblings I never had. I treasure the friendships that I have had for many, many, many years but have come to realize, there is always space for more friends. And that is what I have found in the past few years. We live in a neighborhood where many people are about the same age, starting families, with so much in common. There are many ladies who have been so much more to me than neighbors – they have been my life-line – when the “stay at home” mom world is just too much to bear or I just need someone to talk to about life in general. So, I want to express my gratitude for all of my dear friends – old and new – for these relationships mean the world to me and I never dreamt I could be so lucky to have them all. And I will end with funny part….. 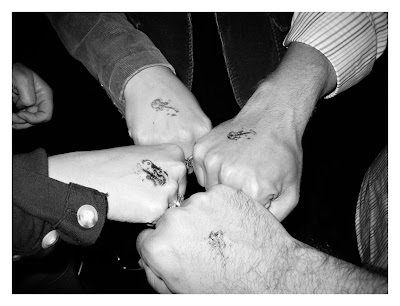 I mean seriously – I can’t even remember the last time I had a stamp on my hand unless it had to do with my child!